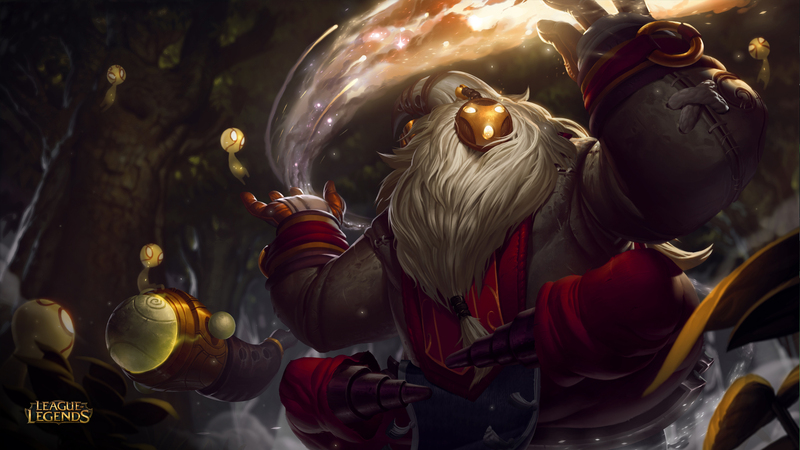 Riot just introduced their latest addition to the League of Legends character roster: Bard, the “Wandering Caretaker.” Trying out our newest article format, “Let’s Talk About,” Jillian and Joey have a chat about Bard’s appearance and judge him on mostly superficial merits. 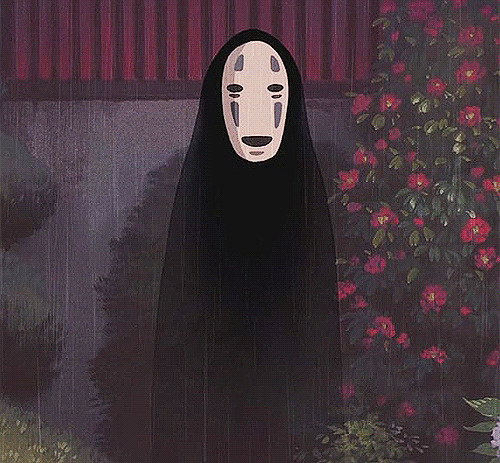 Jillian: Obvious first thought: descendant of No Face from Spirited Away. Joey: Haha, okay, honestly I had a hard time figuring out how Bard even worked as a thing. It’s super small compared to the rest of his body. Jillian: The gold thing appears to be his face, and you’re totally right. 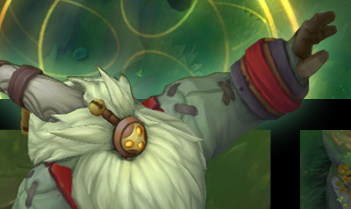 In the main artwork it looks like he’s actually just a giant Santa wig that someone taped a mask onto. Joey: Agreed. He’s just a mess of fur/hair. With some accessories. Jillian: What’s up with his legs/feet? Are those drills? Or one of those cups that retracts in on itself? Do his legs double as a hydration tool? Joey: Whatever they are, they seem like they would be more difficult than stilettos to walk in. Although it looks like every step is agony. Jillian: He floats and stumbles: so pretty standard for a stiletto-wearer. Jillian: What’s hanging off the rings? Those gold things–good luck charms? It’s an awkward mix of teenage mistakes and mystic ritual. He’s also got bells attached to the end of his ponytail. I imagine he’s very jangly. Joey: Agreed. He seems to make a lot of noise in those videos. As expected of a bard I guess? I thought those were mandatory. Jillian: Huh, I didn’t even think about that. Maybe that giant blue orb thing is some sort of instrument? Although it’s definitely not lute-like; he seems to blow into it sometimes. I think we need to talk about his clothes, although I’m trying to figure out what his clothes actually are. Joey: This picture seems to have better angles. Joey: Sidenote: the picture on the bottom left looks like he’s getting off of Air Force One and saluting the crowd. Jillian: Haha, maybe it’s Clinton hiding under all that hair. With a blue orb saxophone. 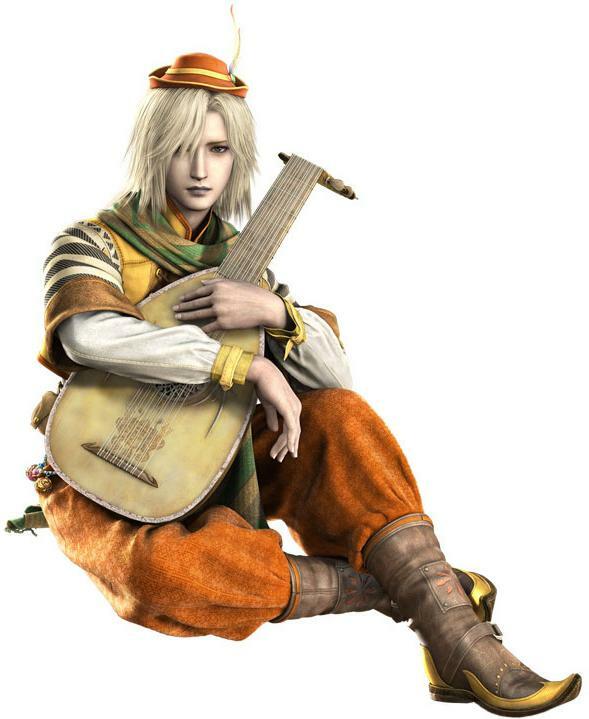 I just don’t really get a “bard” vibe from this getup. Metallic blue shirt with rope-sized stitching and a full-body red apron is more “blacksmith” to me. Maybe I’m too used to Edward-type waif bards, but this guy in general is way too beefy. Joey: I dunno, his hobo look makes me feel sorry for him. Maybe it’s a tactic to get more tips? Jillian: But he’s obviously doing okay for himself: that mane is way too thick and luxurious to not have been conditioned recently. Joey: Good point. He could make some extra cash doing endorsements and maybe buy some actual clothes instead of an apron and some wristbands. Jillian: Actually, looking closely at the presidential salute picture, I think those wristbands are covering up barrels that he’s using as gauntlets. Jillian: How big IS this guy? Joey: Maybe they are mini barrels? Jillian: Like the barrel o’ monkeys game? Now I’m just wondering what this guy did with all those monkeys. Joey: Maybe his mane is made of monkeys he killed? If that’s so, I might have to get him. This entry was posted in Fashion, Let's Talk About, Video Games and tagged League of Legends. Bookmark the permalink. Well, he looks ok to me, for a “wandering” care taker, that “hobo” look is alright, although being a magical being will make you expect that bard is gonna be like a fashionista champ, but with his lore, i think this look is accurate enough for a roaming support..